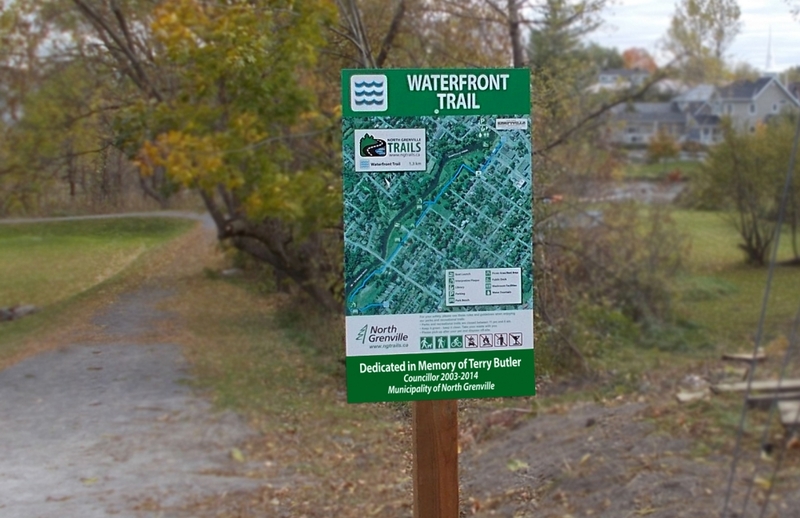 At their November 28 regular meeting, Council dedicated the Waterfront Trail in memory of former Councillor Terry Butler. The Waterfront Trail is a 2-kilometre pathway along the north shore of the Kemptville Creek, connecting Old Town Kemptville to Clothier Street East that was completed in 2017. In 2001, Mr. Butler brought forward an idea to link the downtown area to the Ferguson Forest Centre Trails via a walking trail along the north side of the waterway. The project eventually involved a study by a researcher hired by the Municipality, which concluded that a number of residential property owners along the proposed route had properties that included the shoreline. Even with that setback, Mr. Butler kept his idea on the books. He seized a further opportunity to follow-up on the concept when he chaired the 2006-2007 Rideau 175 Anniversary Committee, held in conjunction with the Kemptville 150th Anniversary Committee. In order to counter the previously identified effect of private ownership of parts of the shoreline, he devised a new plan to realign the proposed trail to follow along Clothier Street East for a short distance to link the downtown area to the shoreline at Curry Park and beyond. In January 2008, the term for the Rideau 175 Anniversary Committee expired, and sadly, a few of the projects had not been completed given time, financial constraints and Provincial regulations. As a result, Mr. Butler faithfully carried on by establishing and chairing the Special Projects Committee of Council in order to meet the goals he had set out for the Rideau 175 Anniversary Committee. Mr. Butler and the Committee finally brought the projects to fruition during the years that followed and the latest Waterfront Trail extension was completed in 2017. Terry Butler passed away on May 30, 2017 but his vision of the Waterfront Trail lives on. Council would like to extend their appreciation to Mr. Roy Brown for suggesting the dedication and for providing the research on the development of the Waterfront Trail. A formal dedication ceremony will be planned and held in the spring of 2019. Photo: A mock-up of what the Waterfront Trail sign may look like after the dedication ceremony.